I'm looking for a car for my daughter as she goes to university in Edmonton AB Canada. I'm a Honda guy but there seems to be better used prices on a Mazda 6. She would ride the bus to school but use it for work and running around the city. She would also come home once a month to work in order to keep her job over the summer; 500 km round trip. What should I be looking for? I know rust was an issue. Anything else? Have you roamed around the Mazda forums? I can only speak to my experience with 2015 Mazda 6. I bought one new for my daughter and it has been flawless through 20K miles. The driving experience far exceeds the Accord. We get great MPG - 37-38 highway and she is averaging 28 overall. One thing to be aware of on later models is the energy reacapture system they are putting on upper line models. According to the service department it requires a deep cycle battery that costs $300. I would think that negates a lot of the benefit as I have not heard there is a big diff in MPG. For me less complexity is more. Good luck with the purchase. I had an Accord back in 2003-2012 and had a wonderful dealer but soured on the brand after my timing chain stretched and needed to be replaced ($1200) at 100K which I considered to be premature failure. I asked for a contribution from Honda and got nothing. Honestly, I would have been happy if they discounted the chain $100 but they denied me any assistance. SO for my next car I got an Infiniti without even stepping into an Acura showroom. Best move ever - a great car and awesome reliability 95K miles and no repairs. I have a 2009 and 2012 Mazda 6 in my household. Both have been very mechanically reliable. The 2009 has Appox 125K miles with no major repairs. There is a slight rust issue on the lower inside of the drivers side door. I have touch it up a number of time but have not arrested the issue...not a big deal though. The 2012 has only been in the shop for the crappy infotainment system. Mechanically flawless with great gas mileage too. I have previously owned 2 other Mazdas that were great til about 150k when they had some electrical problems (84 GLC and 90 Protege'). Check consumer reports used car reliabilty chart. In my opinion very good cars and cheap to keep. 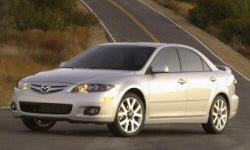 I have seen a few 1st generation V6 Mazda 6's with faulty head gaskets. Avoid the V6 and get the 4 if you must. Make sure you get side curtain airbags as well. I bet some older models did not have it standard yet.